Thorough investigations of the physics and chemistry of lakes Monoun and Nyos quickly revealed that both lakes still contain huge amounts of carbon dioxide (10 millions m3 and 300 millions m3 in Monoun and Nyos, respectively) and that this gas is being added at such a rate that saturation could be reached within years in the deep layers of the lakes. Since it is impossible to guarantee the perennial stability of the lakes, it has been proposed to make these lakes safer by extracting, in a controlled way, the carbon dioxide they contain. The process is no more than a limnic eruption brought under control ; it is inspired by the industrial process known as "gas lift" and, more precisely, by the methane (and CO2) extracting unit which had been operating at Gisenyi, Ruanda, on the shore of the African lake Kivu (another gas-bearing lake, but far from saturation). 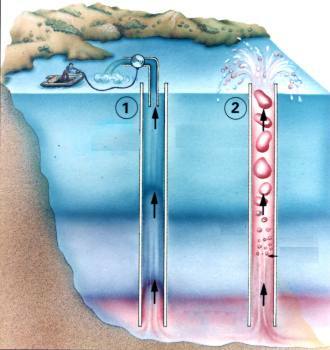 The method consists of a pipe set up vertically between the lake bottom and the surface. A small pump raises the water in the pipe up to a level where it becomes saturated with gas, thus lightening the water column; consequently, the diphasic fluid rises to the surface. Therefore, once it has primed the gas lift, the pump is not needed, since the process is self-powered : above the saturation level, isothermal expansion of gas bubbles drives the flow of the gas-liquid mixture as long as dissolved gas is available for ex-solution and expansion. In 1992 at Monoun, and in 1995 at Nyos, M. Halbwachs and J. Grangeon demonstrated the feasibility of such a process. In both cases, the eruption of a gas-water mixture was primed through a 140 mm diameter pipe (made of high-density polyethylene). The measured flow-rate matched the results of a numerical modelling of the diphasic flow, as carried out by G. Kayser, and the reliability of the remotely operated control valve for stopping the flow on request was also demonstrated. These successful experiments pave the way for an operational scheme of degassing lake Nyos and lake Monoun down to a level that would rule out the possibility of a limnic eruption.